If you like California rolls, you’ll love these nori wraps (though personally, I think they’re so much better!). The tahini dressing is truly addictive—you’re going to want to dress everything in it—and the cabbage provides a nice crunch. If possible, use a food processor to slice the cabbage so you can get it super thin. Also, make sure the vegetable strips are all the same width and length so that they don’t hang over the edges of the nori sheets; this will make rolling up the wraps easier. 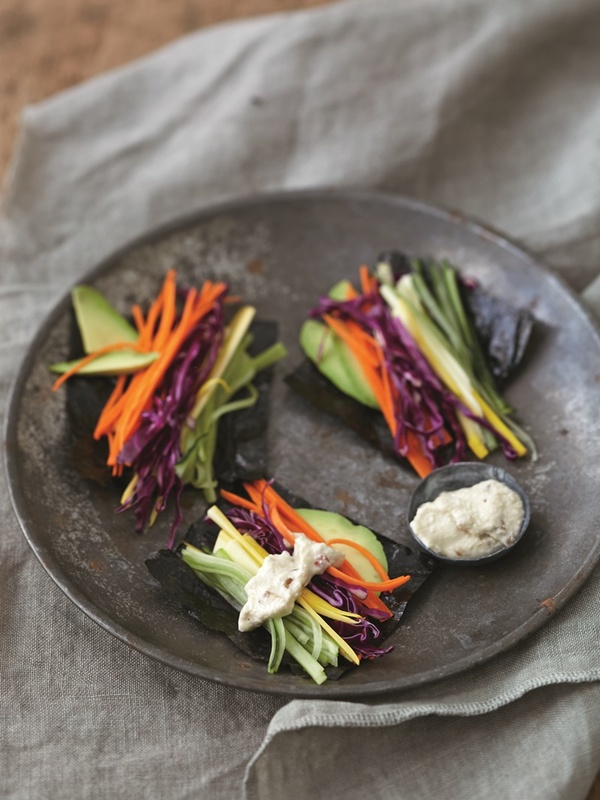 Use leftover tahini drizzle as a dressing for salads or as a dip for crudités. Combine all of the ingredients except the water in a blender. Blend, adding water 1 teaspoon at a time as you go, until the mixture becomes a thin sauce. Place the nori sheets on a flat surface. Divide the cabbage, carrot, squash, cucumber, and avocado among the sheets.